8″ x 10″, softcover, 178 pages, Civitas Consultants. With women responsible for more than 80 percent of retail and residential decisions, it’s time to focus on making the downtown experience more appealing to women. This thoughtful new book provides a fresh look at downtown through the eyes of women and insights into designing both physical spaces and experiences with them in mind. Recommendations for change fall into several broad categories including branding and marketing, improving access and parking, streetscape design, and programming downtown with women in mind. Each section was prepared by a subject matter expert and provides both compelling evidence for the benefits of focusing attention on women and concrete steps for moving forward. David Feehan is a world-recognized expert in downtown revitalization and president of Civitas Consultants. Drew McLellan is the co-founder of the award-winning McLellan Marketing Group. Sheila D. Grant is the former editorial director of Downtown Idea Exchange newsletter. 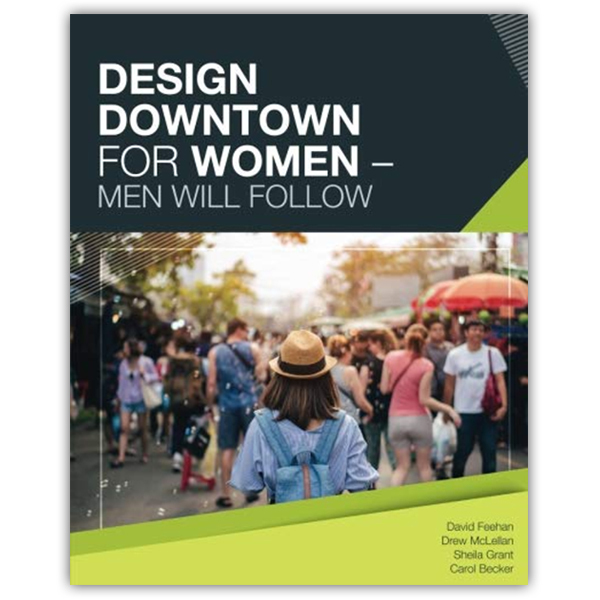 Design Downtown for Women — Men Will Follow is guaranteed. If you are not 100% satisfied, you may return it within 30 days for a full refund.